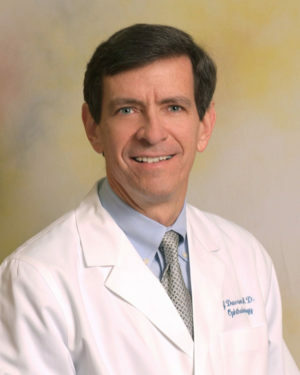 A Virginia native, Dr. Dawson received his undergraduate degree from Emory University in Atlanta and his medical degree from the Medical College of Georgia, where he was class valedictorian and president of Alpha Omega Alpha Honor Medical Society. After an internship at the Medical College of Georgia, Dr. Dawson completed a three year ophthalmology residency at the University of California at San Francisco. He then did an extra year of fellowship training in corneal and cataract surgery at Wilmer Eye Institute of Johns Hopkins University. Dr. Dawson has practiced in Knoxville since 1990 and in Sevierville since 1994. He is a board-certified ophthalmologist and Fellow of the American Academy of Ophthalmology. He is also a member of the Tennessee Academy of Ophthalmology. He has repeatedly been selected by his peers as one of Knoxville CityView Magazine’s “Top Doctors”. Dr. Dawson is married to the former Joan Plattsmier. They have one daughter, Madalene. He enjoys spending time with his family, reading, and watching football and basketball. He has participated in endurance sports and has done several ultramarathons (100 mile races).